Author: Molly Elliot Seawell, James Barnes, Ellen Douglas Deland, John R. Coryell, E. Carruth, et al. 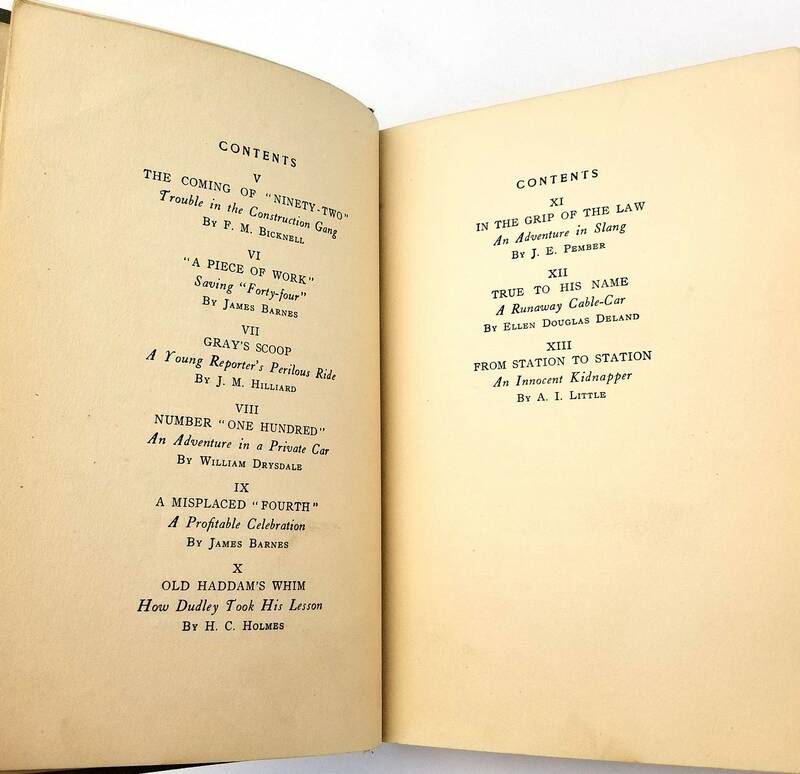 Description: First Printing, September 1909. Scarce. 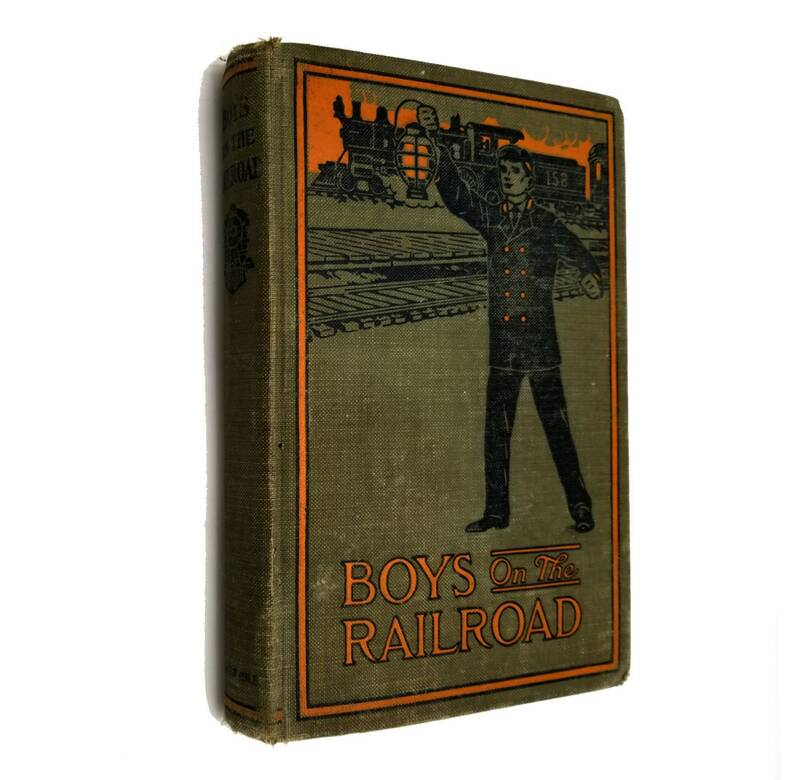 Olive colored cloth boards with orange and black design of a railroad lantern signal man. Head and tail of spine worn. Ffep appears to be missing. Gift inscription on reverse side of frontis. Corners bumped and frayed. A little bit of soiling of some of the pages. 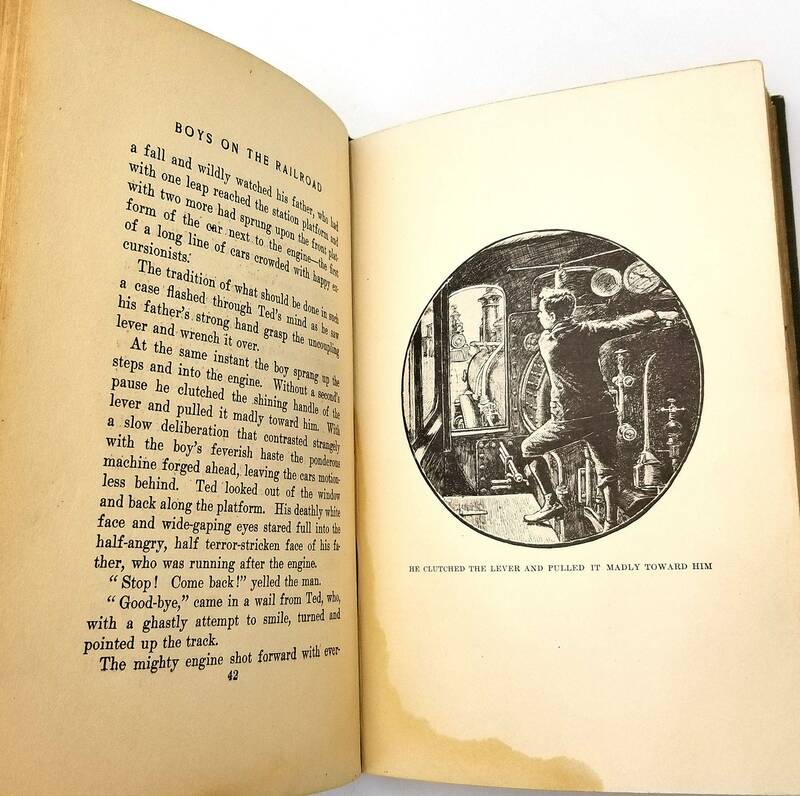 Most of the 8 illustrated plates show damp staining to their lower interior and bottom edges (but not affecting the actual illustrations). 13 stories by various authors. 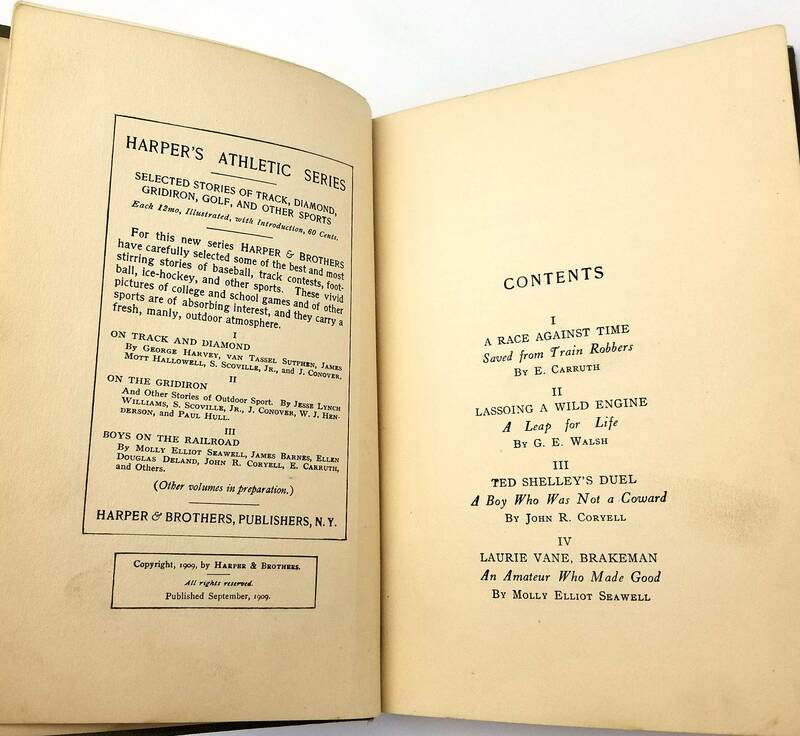 Part of the Harper's Athletic Series. 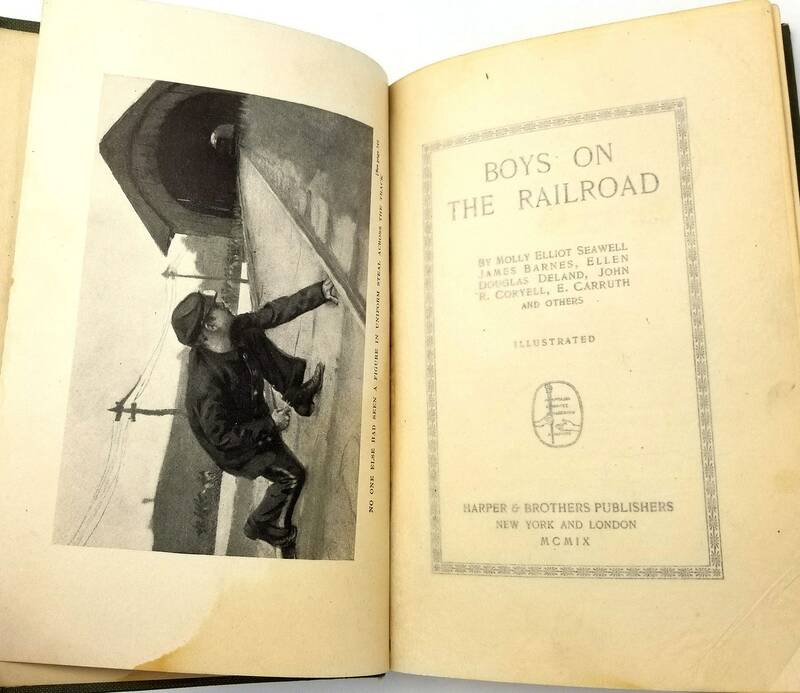 Stories include: A Race Against Time: Saved from Train Robbers (E. Carruth); Lassoing a Wild Engine: A Leap for Life (G. E. Walsh); Ted Shelley's Duel: A Boy Who Was Not a Coward (John R. Coryell); Laurie Vane Brakeman: An Amateur Who Made Good (Molly Elliot Seawell); The Coming of "Ninety-Two": Trouble in the Construction Gang (F. M. Bicknell) A Piece of Work: Saving "Forty-Four" (James Barnes); Gray's Scoop: A Young Reporter's Perilous Ride (J. M. Hilliard); Number "One Hundred": An Adventure in a Private Car (William Drysdale); A Misplaced "Fourth": A Profitable Celebration (James Barnes); Old Haddam's Whim: How Dudley Took His Lesson (H. C. Holmes); In the Grip of the Law: An Adventure in Slang (J. E. Pember); True to His Name: A Runaway Cable-Car (Ellen Douglas Deland); and From Station to Station: An Innocent Kidnapper (A. I. Little). Size: 6.75 x 4.75 inches.